OpsCenter installation options include package installations using YUM and APT, and binary tarball. DataStax agents must be installed on every managed node in a cluster and are necessary to perform most of the functionality within OpsCenter. Install the DataStax OpsCenter using Yum repositories on RedHat Enterprise Linux (RHEL), CentOS, and Oracle Linux (OL) distributions. Install DataStax OpsCenter using APT repositories on Debian or Ubuntu distributions. Install DataStax OpsCenter on any Linux Distribution or Mac OS X using the OpsCenter binary tarball. Instructions to uninstall OpsCenter for all installation methods: standalone, RPM, Debian, or tarball. If automatic agent installation was unsuccessful, manually install the agents. Describes necessary directory and file permissions if you need to run the agent as a different user than the default user for DataStax Enterprise, which is cassandra. DataStax agents do not pick up the environment variables of the currently logged in user by default. After adding a cluster, OpsCenter will determine whether agents are already properly installed and configured. If they are not, you will be prompted to check the status of the agents and potentially install them from the Agents tab. Root or sudo access to the machines where the agents will be installed. JMX connectivity is enabled on each node in the cluster. Either you configured the SSH port, or accepted the default SSH port (22) for node-agent communication. DataStax Enterprise 4.7 or greater. 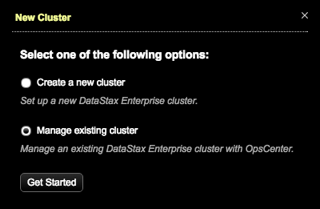 Start your DataStax Enterprise cluster and the OpsCenter daemon. Open a browser window and go to the OpsCenter URL at http://opscenter_host:8888, where opscenter_host is the IP or hostname of the OpsCenter machine. A dialog prompts you to select a cluster option. Click Manage Existing Cluster and Get Started. The Connect to Existing Cluster dialog appears. Add one or more hostnames or IP addresses of the nodes in the cluster. For best results, use private IP addresses. The Set Up Agents dialog appears. Install or start agents automatically is selected by default. Click Next. If your environment requires manual installation of agents, click Install agents manually. Click the link to access the instructions for manually installing agents. The Install Agents - Credentials dialog appears. Required: Enter a Username. The user must have root or sudo privileges. Optional: A sudo password can be entered in the Password box. Optional: Enter a Private Key. No information entered in the Install Agents - Credentials dialog is saved or stored. Click Install. The Agents tab opens and displays the progress of the agent installation. DataStax agents have been deployed and configured for each managed node in the DataStax Enterprise cluster. If you were unable to install the agents through the OpsCenter UI, follow the instructions to manually install the agents.